I love the writing style of Nicole Williams, she never fails to deliver a well written and engaging storyline and Roomates with Benefits was no different. 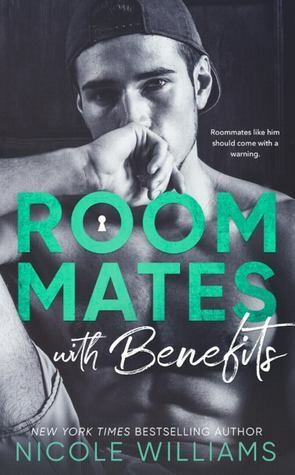 For me, this was a cross between a rom com and a traditional contemporary romance, there were those laugh out loud moments, mainly at the hands of Soren and then there was the angsty, swoony moments that perfectly balanced this novel. This was a one sitting read for me, from start to finish Soren held me at his mercy and while the heroine takes a little warming up to, by the end I had Hayden’s bag. Hayden was a small-town girl, making her move to the big city to break out into the world of modelling. Having landed the top agent, her stars were finally aligned and though this was a huge move for her, she wasn’t very well prepared. In all honesty, I felt Hayden was a little naïve, she was incredibly cute, but sometimes, the naiveite was a little irritating, because seriously, can anyone really be that blind? However, Hayden saw the best in everyone, thought everyone was out to help everyone with no agenda and tried her damnedest to fit in and regroup. Yes, it was a task, but she does eventually get there, all thanks to Soren’s help and wise words. Soren was seriously adorable, from his very first scene this man charmed his way into my heart as well as Hayden’s he was the epitome of the cheeky chappie, but he had a heart of gold. Soren worked his socks off, he studied, he worked and he played ball. He was the perfect roommate being that he was hardly ever there. From the moment he met Hayden, he knew she was a fish out of water and so the protective and caring side of him shone through. These two had many laugh out loud moments but the thing I cherished the most was the gradual slow burn romance that Nicole Williams elicited with every word. This was like an instant hate, to a mild dislike, to a friend, to best friends and to more. But each step of their relationship felt natural and organic, nothing felt forced, it just felt right. The dialogue was on point, their friendship was faultless and once the family gets involved…the laughs just keep on coming. Soren’s family really helped make this book, I adore them and would love to be a part of them. It is testament to this family that Soren turned out into such an upstanding guy in the first place, and given his brothers, Hayden got the best of the litter. Yes, there were some parts of this book that I felt were not needed, some made me feel a little uncomfortable but given the read as a whole, there was not much to dislike. I did feel that Hayden’s meteoric rise to modelling fame was maybe a little stretched and one or two other things, but who cares, it made for good reading. It is fiction and sometimes we do have to suspend logic at times. But, I loved the chemistry, I loved our cheeky chappie, he was just one of those guys that stole every scene and you wanted to hug, he was seriously that endearing, not your typical college sports star. One other character I wanted to seriously dismember, but hey ho, it all added to the drama. Overall, really enjoyed this book and would recommend.